Well maintained outdoor lighting systems last much longer than those that are not maintained. Outdoor lighting maintenance should be performed on a regular basis. Set a calendar and check the system on the first day of each season for example. Or check it the first day of every third month. No matter when you check your system you should check your system regularly to make sure the components are in good working order and not subject to premature failure. We’ve seen some really poorly maintained systems in our day. Don’t find yourself having to deal with problems resulting from neglecting your lighting system. This video below show a fixture that was neglected. Over time ivy had grown over the fixture and the spike was bent over and the fixture was touching the ground. Then ants built mounds of soil around the fixture. Then the seals failed and the bugs got inside. Finally these bugs (maggots?) got inside and ate everything up. It was so bad the fixture could not be rebuilt. We just had to replace it. If the owner had just checked it every so often and kept it upright this never would have happened. Check for cuts and nicks in the wire. If you find flaws either replace the entire wire section or splice the wires (at the point of cut or nick). When we are called to fix lights that don’t work the number one reason for failure is typically the connections. If you’re connectors are exposed make sure they are tight. Hopefully your system has direct bury wires and waterproof connectors. If you don’t have waterproof connectors consider replacing them. 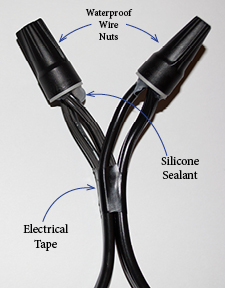 It is good practice to use zip-ties or electrical cable to secure the wire bundle just before the connector. This make it harder for the wires to be accidentally pulled apart. Ivy covering fixture needs to be trimmed back. Plants block light and create shadows so you need to keep them away from your lights. Plants and roots can grow into fixtures if left unchecked. This will lead to infestation by bugs, ants or other small animals. Lightly mist around your fixtures with bug spray if necessary. It is obvious that no outdoor lighting maintenance was performed on this system. The fixture has sunk below grade and this will severely reduce the life of this component. Fixtures get moved by humans, falling debris, animals and weather. Make sure your fixtures are still focused correctly. Seasonal and annual plant growth may necessitate adjusting fixtures. Make sure all set screws and nuts are tight. If you don’t perform outdoor lighting maintenance this is what your fixtures will look like. Most of the time it is obvious when a bulb burns out. However sometimes we don’t notice it. Be sure to turn your system on when you perform your inspection so you can identify faulty bulbs. Consider replacing halogen with LED bulbs to save time and money. If you’re having to get inside your fixtures consider applying corrosion prevention compound like Dielectric grease to the electrical connections. This will prevent corrosion as your fixtures age. Mitigating rust and corrosion are key to good outdoor lighting maintenance. Clean lenses, reflectors and posts. You’ll find bird droppings, spider webs and other foreign matter on places like the top of your path light lids. It is best to keep your fixtures clean and free from anything that wasn’t on the fixtures when you bought them. If you let things build up on your components then eventually they will get to the point where you won’t be able to get them back looking the way they did when you purchased them. Keep everything clean and looking good and you’ll never have to deal with fixtures that have deteriorated due to neglect. If regular inspection isn’t your bag and you’d like some help give us a ring. We’ll be right out and perform the inspection for you. If we find work that needs to be done we’ll discuss it with you and you can take care of it or let one of our technicians perform the job for you. But no matter who does it, make sure you inspect your system and keep it in good shape to get the most out of your investment.